a gorgeous set of two primitive shaker boxes made of paper mache. Each is hand painted and stenciled. The largest has a 9 inch diameter painted in mustard and stenciled with black letters; linens . 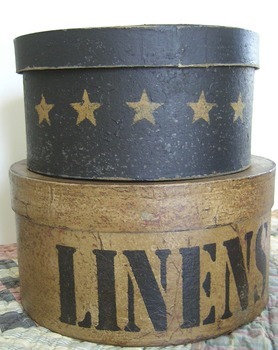 the smaller is black and has stenciled mustard stars with an 8inch diameter . Great for keeping you smalls.